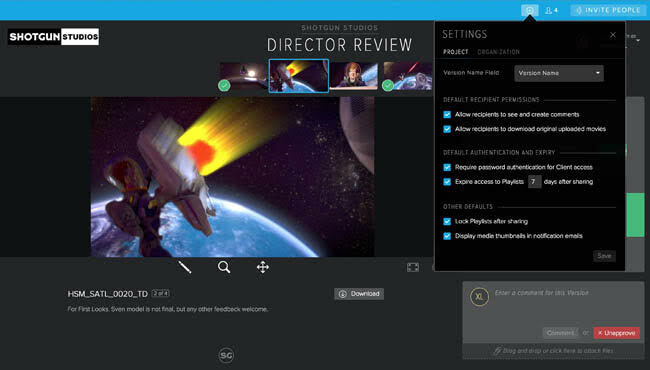 Shotgun Software released Shotgun 6.3 with a new set of features and updates that will make it easier for teams to review, share and provide feedback on creative projects (view video below). – The Media App has gone global, allowing users to easily access and manage media across all of their studios projects from one, easy-to-access location in Shotgun. – Artists, supervisors, and managers can now browse media based on a project’s hierarchy, enabling them to find the media they need within their projects faster. For example, quickly filter by sequence>shots on film projects or episode>shot on episodic TV projects. – An All Playlists view helps users easily find and see all the playlists on their Shotgun site or drill down to playlists on a specific project. – Media Launching Preferences let users customize exactly how their media is launched from the Media App, turning the Media App into a super-powered springboard to accessing media whether it’s in the cloud or stored locally. – Version/Playlist Sharing also makes it easier to share a specific version or playlist with colleagues. Quickly copy a link to share and then email or IM it for immediate review. – Now studios can more quickly invite multiple client contacts to review work, control password options with a wider range of security requirements, and collaborate faster with clients by adding attachments to notes and replies. – Configurable sharing of security settings allows control over whether a password is required to access a project. This is for clients who sometimes favor speed above all else. A revamped Manage Share menu puts the user in control of who has access to their shared work. The release of Shotgun with RV has opened up a new world of possibilities. With Shotgun 6.3, its easier for artists to submit their work with the addition of a My Tasks view in the Screening Room for RV Submit Tool. They can even Notify others about their new work via the Shotgun Inbox in just one click. Shotgun pricing starts at $30 per account/per month with Awesome support, or $50 per account/per month with support. For more information, please visit: http://www.shotgunsoftware.com .